In 2014, the Mediterranean diet, Japanese diet and the Paleo diet were among the most popular diets. Although not entirely new, the New Nordic diet is slowly rising in popularity in the world of diet and nutrition. Initially developed in 2004, chefs and food professionals from the Scandinavian countries of Denmark, Norway, Iceland, Finland, and Sweden met in Copenhagen to form a new regional cuisine. Several of its characteristics include affordability, simplicity and minimal food waste. These three factors alone make it a sustainable diet. The New Nordic diet is heart healthy. It is god for those suffering from cardiovascular disease. Aside from that, it was also created to combat the onset of metabolic diseases such as diabetes as well as to prevent cancer. Calories and proteins is best obtained from plant sources rather than animal sources. Plants increase unsaturated fats in our diet and significantly lower our intake of saturated fat. Moreover, increasing our calorie intake from plant sources enables us to increase our fiber, mineral and vitamin intake. Plant proteins satiate us faster and provide us with the same energy level that we need with lower calorie intake. Increase intake of seafoods. Fish and shellfish are also good sources of protein. Most marine sources are also rich in minerals. Compared to red meat, fish and shellfish are low in fat. They make as good alternatives for those who are suffering from type 2 diabetes and obesity. Eat more food from wild animals and plants. Wild animals are known to have leaner meat compared to those who are raised to be slaughtered. They contain more polyunsaturated fats and less saturated fats. Meanwhile, plants such as wild berries, fruits and wild mushrooms contain more vitamins and minerals than those raised in orchards. 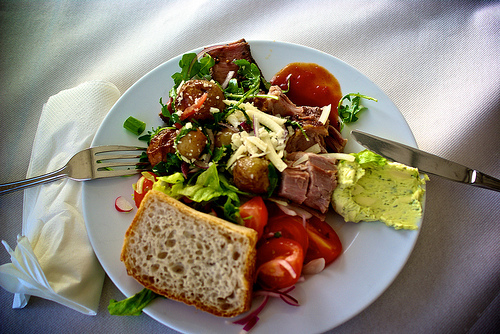 The New Nordic diet focuses on eating fats and carbohydrates from healthy sources. It also emphasizes the importance of dietary fiber and whole grain cereals. It takes into account the glycemic index since this diet aims to prevent metabolic diseases. Food is cooked using low temperature methods such as oven broiling and baking. Unlike other types of diet, the New Nordic diet aims to use local foods because they are cheaper and more attainable. The diet also prefers organic food and those from wild sources because they are pesticide and fertilizer free. The diet also believes in utilizing as much as permitted to minimize waste. Some of the most commonly used ingredients in a Nordic diet dish includes fish rich in fatty acids such as salmon, herring and mackerel. Canola oil is most commonly used in Nordic cooking. It contains lesser amounts of saturated fats than olive oil. Another significant ingredient in Nordic dishes are berries and currants. Wild berries are usually added to meat and fish dishes. Being common in the Nordic region, elks and deer are mostly consumed. Other common ingredients include potatoes, nuts, whole grains, beans, fruits and vegetables.